Last year was a tumultuous one for cannabis stocks, further deterring institutional investors from getting involved in a notoriously high-risk sector. A sampling of 12 stocks analyzed by Marijuana Business Daily started the year off strong, collectively rising about 27% during the first few weeks of 2015. But the tide quickly turned, and the stocks ended the year down an astounding 65% from where they started. In fact, every one of the stocks examined fell significantly last year. The decreases ranged from 38% for AmeriCann – a cultivation technology and real estate company – to nearly 100% for lab testing company Pazoo, which was also the only one of the sample to not post a single day of positive returns in 2015 compared to where it started on Jan. 1. Pazoo ended the year trading at less than a tenth of a penny. All of the stocks analyzed are listed on the over-the-counter markets, where almost every other public cannabis company trades. By comparison, the S&P 500 was flat – ending 2015 almost exactly where it started the year – while the Nasdaq rose about 6%. 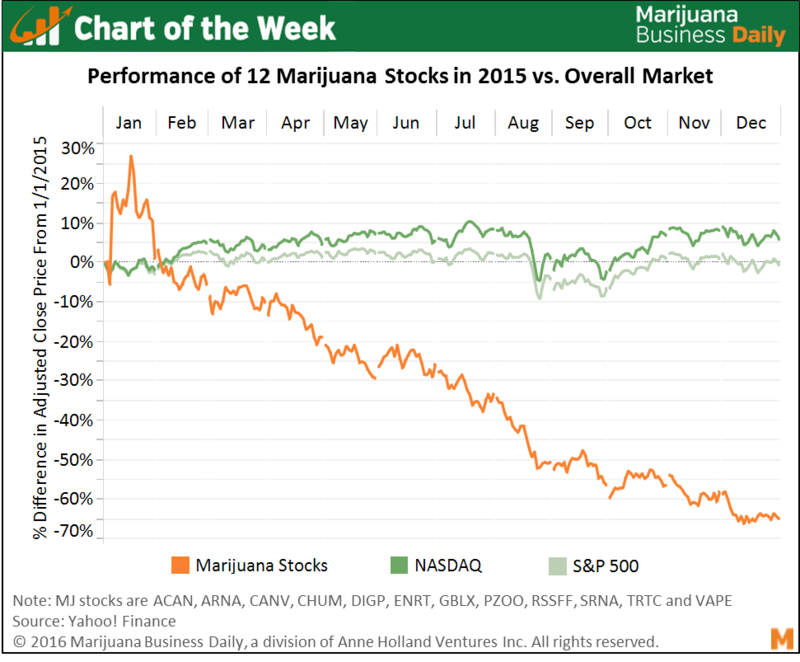 To be sure, some individual cannabis stocks ended 2015 in positive territory, while others that ultimately ended down managed to record impressive sustained rallies at some point during the year. Regardless of where they finished the year, though, many fluctuated significantly at some point along the way, demonstrating the tremendous volatility of these investments. Note: Stocks selected for this analysis were ACAN, ARNA, CANV, CHUM, DIGP, ENRT, GBLX, PZOO, RSSFF, SRNA, TRTC and VAPE. No consideration was given in stock selection other than to ensure broad representation across all sectors. Just about all marijuana “stocks” are garbage. No credible company trades on the OTC pink sheets. Avoid them all and invest in the angel/VC route. It’s an over simplification to only state the share declines the industry continues to see. What is valuable for readers is why. A lot more factors at play than the industry. Management, leadership, business acumem, viable strategies, capital, and scalability are only touching the surface. How about the intended pump and dump! If Cannabis comes off schedule one, these stocks will skyrocket. This will happen Mr. Trump said that. it should be left up to the states.